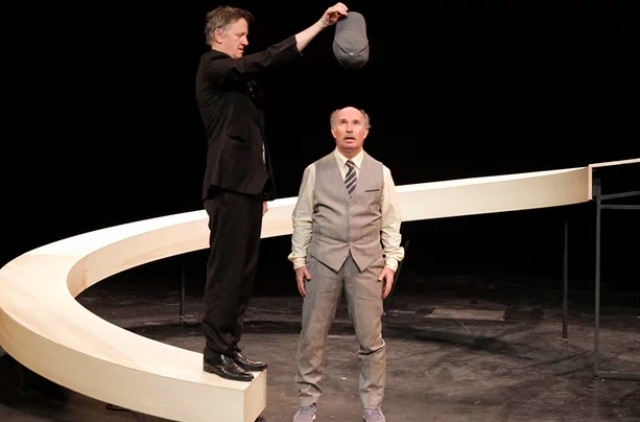 At the Polonsky Shakespeare Center in Brooklyn, Theater For a New Audience brings us a pair of comic one acts. Marcel was created by and features Joe Houben and Marcello Magni. The Art of Laughter is a complex soliloquy of Houben’s. 'Bodies our flesh is heir to' is the subject of the evening. 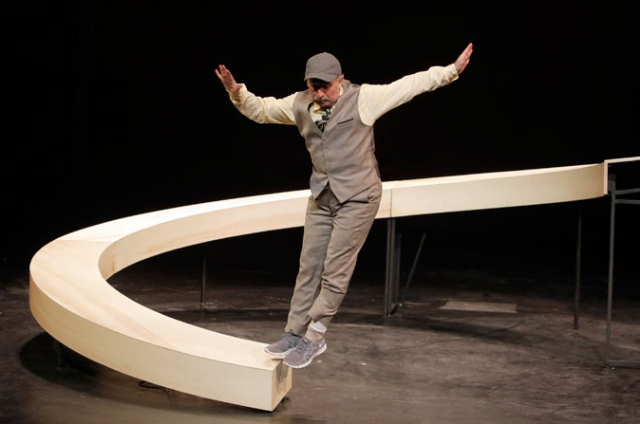 Magni, one of the founders of the visionary British theatre company, Complicite, contemplates aging and its impact on his physical performance. Magni and his collaborator and fellow clown, Joe Houben, teach us why we laugh by inducing our guffaws and hearty roars tumbling from entire bodies. They also move us deeply. Along the way, he knocks out two small blocks of wood in a moon shaped plank. These end up in the first row of the orchestra and are thrown back by an audience member. The evening encourages audience participation. One young man was invited up to the stage to try to control a fold-up stool. Unsuccessfully. When a moon descends, Marcel battles it to the ground before it springs back to heaven. Is Marcel going to follow the moon’s course soon? Examiner and artist bat back and forth as they place arms in a coat for smooth transfer. Magni puts on a horse’s head and soon we have a four-legged beast with a plumed tail on the back end of the second man. Houben’s children like the horse best of their father’s impersonations. They already know the chicken and fish that appear later. Not only is Marcel about Houben and Marcello Magni, it details the history of clowning through the slapstick acts of the 19th century music hall and Chaplin. Magni may be facing the end, but he is alive as he prances his talents on the stage. We come to recognize our own absurdity in the charming tom-foolery of these clowns. Houben is perfect as he soliloquizes on the subject of laughter in the second one act. Presenting man as a vertical body reaching always for the stars, we learn that humans are only really themselves lying on the floor, legs curled like an infant’s, howling with laughter, exposed. Homo erectus is homo ridens. Physical comedy, we are warned, takes lots of practice. You can’t just imitate a chicken. It is only funny if you imitate a chicken perfectly. How humans react to a surprising painting displayed in a gallery is brilliantly drawn with a sudden look back, and an awkward move of the head to let the eyes have a closer view. We also get to look at a fish examining a Mondrian. Picasso would have liked the dog who slurped before Les Demoiselles d'Avignon. Do we have a choice: To laugh or not to laugh? Not in Houben’s hands. His escalation of a waiter’s problems is hilarious. It is difficult to describe Houben’s imitation of Camembert cheese and probably difficult to imagine. The first step toward ‘Cam-” is arms forming a large circle, the poplar wood container in which Camembert is first delivered. And so on. The two plays formed a touching, erudite and yet very common evening of physical comedy as high art. We end up laughing and touched.